Please take this opportunity to nominate an outstanding student from your school district, community/state college, or community-based program. We are looking for students who have made a positive contribution to their community, now have significant life responsibilities, have met life goals as a result of completing an adult education program and have overcome difficult circumstances. The nominee does not have to be currently in school. This proactive marketing plan is to increase awareness of adult education and career and technical education statewide, and show how vital adult education is to Florida’s economic recovery and growth. ACE wants to get the story out by identifying adult students who have reached their life goals, improved their standard of living, achieved a higher paying job, advanced to higher education, or attained a career goal. The “Sunshine Success Stories” is a project that highlights learners who have attended adult education programs, overcome personal roadblocks, and are now successful and productive citizens and family providers. Every day in adult education classes around the state, success stories are being made. Adult students of all ages and backgrounds are overcoming hurdles and hardships to complete their high school education to improve their lives and the lives of their families and communities. Earning your GED or high school diploma begins the transition to better employment opportunities and/or post-secondary studies. Click on the links below to hear about the latest success stories from Brevard and Leon County adult education programs. Help us help you keep adult education alive and well in Florida so we can continue to serve our students. Contact the ACE of Florida Foundation office, (850) 222-2233, or email ace@aceoffloridafoundation.org with any questions or concerns. 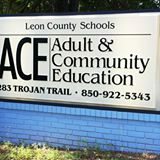 Leon County Adult and Community Education School shares many of their success stories via their Facebook page. The mission of Adult & Community Education (ACE) Leon is to provide educational opportunities, through the use of school and community resources, enabling learners to become responsible, independent contributors in the community in which they live and work. Kiara has had severe anxiety and depression all through school and she always had bad experiences with teachers telling her that she wouldn’t make it and what’s the purpose of her being here. This got worse in the 8th grade and she dropped out. In addition, her mother suffered a mini stroke and as a result, she and her family ended up being homeless. Almost her whole life, Kiara and her family have been in one shelter or another. Kiara’s attendance was so poor that her mother got into legal trouble because of the truancy. Kiara had eventually gotten a job in childcare, but got laid off after 5 years. While unemployed, she realized that for her to get another job or a quality job, she would have to get her education. There is no free ride out there anymore. Kiara used to feel like why try? She was crippled by the fear of returning to school. The big moment, however was last year’s graduation, her sister decided that she was going to go to ALCO to get her diploma. She did online classes and was able to get her diploma. Kiara was in the audience and decided for the new year of 2018 that she was going to go to school. Kiara immediately tested into the GED prep classes even though she was out of school for so long. Kiara says that she knows what it feels like to feel dumb; feel counted out. She would hear other students beat up on themselves. There were times when she felt she was broken, crying on the floor. Even through those times, Kiara didn’t give up. She would still read; she read the dictionary because she thought she could learn to speak well if she knew big words. Though Kiara had anxiety and depression as obstacles, there was always that part of her that wanted to be an educated woman. At 26, Kiara decided she deserved this; a chance at new opportunities and a new life. It started with a belief in herself and it manifested before her eyes with hard work and a lot of studying. She created wristbands to wear to remind herself and other students that they can achieve anything and reaffirm their self-worth. The wristbands read, “I can. I will. I did. I am greatness.” It’s a declaration that you can achieve the impossible and overcome any perceived obstacle. Christina came to the Withlacoochee Technical College’s (WTC) GED preparation class in April 2014 as a scared, recently divorced 38 year old with four children. Her husband (a doctor) had recently left her as the sole provider for herself and her children, but she had no job. The home she and the children lived in was in foreclosure. She had trouble finding a job without a high school diploma. Christina quickly proved she is a hard worker and needed to get done fast. With four children and little to no income, she needed help. The local United Way stepped in to assist her with food and to help her get her feet on the ground. Christina earned her GED credential within nine weeks of enrollment at WTC and was awarded a two year scholarship to the College of Central Florida. Christina is currently enrolled in the Paralegal Studies program at the College of Central Florida where she maintains a 3.5 GPA and is employed part time in the College’s TRIO program as a tutor and mentor in the WTC GED preparation program. Quote from Christina: “If you are willing to work hard, the sky is the limit and anything can be achieved. Tabita is a Romanian immigrant who lived a harsh life under Communist rule. Before the Revolution, she and her family experienced extreme rations on food, water and electricity. At the age of 18, her family moved to the United States – a long-time dream of hers. She worked as a full-time nanny for 4 years, which allowed her to save money and eventually pursue another dream: attending art school. She attended art school in Chicago. Several years later, Tabita returned to school to earn her high school diploma through the Lee County GED Program. At the time of enrollment, Tabita was battling with many struggles. However, she turned school into a refuge where she could escape and focus on goals. Tabita’s determination molded her into a highly successful and motivated woman. To her, the GED program was the foundation for her educational triumph and helped build her confidence through the encouragement of her teachers. Tabita earned her diploma in only two semesters all while maintaining a job and dealing with life’s numerous trials. The faculty unanimously selected her as the student speaker for the graduation ceremony where she delivered an inspiring speech to a crowd of over 1,000 people. Immediately following graduation, she enrolled at Florida Southwestern State College and began her coursework to become a Physician’s Assistant. At FSW she maintained a 3.81 GPA and was recognized by several professors as a leader in the classroom. She is currently awaiting acceptance from Miami-Dade College’s P.A. program. Her ultimate goal is to open her own clinic as a P.A. Along with being a full-time student and maintaining a job, Tabita dedicates much of her spare time each week volunteering with the local chapter of Habitat for Humanity and the Salvation Army, and her local church. Silvia moved to the U.S. from Mexico in 1998, and started working. She soon found that she couldn’t speak English well enough. Once she had children, they became the most important reason for Silvia wanting to go to school and improve her English. She was determined to be able to communicate with her children’s teachers so she could support them in their education. When her youngest went to school, Silvia decided to go to school. Silvia was enrolled in the Seminole State College of Florida Adult ESOL Program, and after completing those language-learning classes, she enrolled in college-credit English for Academic Purposes classes and completed the program in May 2012. Silvia’s immediate plans are to prepare to take the Nursing Pre-Entrance test, and she is considering several educational options including getting a degree in nursing or in the psychical therapy program. She is also considering the option of completing a degree in psychology. Sylvia is very motivated and committed to continuing her studies. Regardless of where her path leads, Silvia plans to enter a field where she can help and serve others. Meeting the 24 year old Cuban, Darlin Guerra might give you the impression that she is all smiles, but underneath that facade there is this strong-willed and determined student who has always had her eyes and mind set on one target, becoming a doctor. Born and raised in Matanzas, Cuba, her parents worked very hard to give them decent conditions and a good education. Darlin loved spending time with her grandmother and when she got sick, she was by her side day and night taking care of her. This traumatic experience led her to pursue her interest in the field of medicine. Although her mother was an experienced dental hygienist and her father a well-seasoned English teacher, they haven’t been able to work in their respective fields for many reasons. Darlin has had to steer the wheel for the entire family to support them financially. She drove her parents to work and school, she attended her younger brother’s PTA meetings. She got up at 4:30 a.m. to start working by 5:00 a.m. After her shift she would drive miles to attend school. It was a huge sacrifice on her part, but that didn’t decrease her perseverance and determination. Her unwavering desire to learn and pursue her dreams paid off when she was accepted into a local community college to continue studying medicine. Darlin is now enrolled in the Hillsborough Community College to study medicine.